Full details are on the Clock kit page. 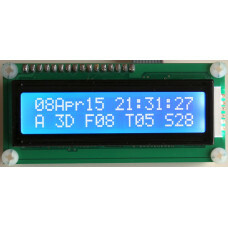 Customisable shack clock with optional GPS interface, displays time, date, GPS parameters and temperature (two temperature sensors may optionally be connected). This clock kit is based on the same kit (PCB, components etc) as the Ultimate3 QRSS/WSPR transmitter kit, but with a different firmware version (and of course, no LPF kit or Si5351A module kit). Some components for the U3S kit will be included in the Clock kit bag but are not used. A GPS receiver module such as the QRP Labs QLG1 kit can optionally be connected directly to the clock kit. One GPS kit can be connected to multiple kits (e.g. Clock kit, VFO/SigGen kit, Ultimate3S kit). The clock can also operate independently without GPS, or with another 1 pulse per second (pps) signal source. The clock has 10 configurable alarms, which can also control I/O signals or activate relays if connected. These could be a QRP Labs TX2/5V relay (available in this shop), or the QRP Labs 6-band relay board. There is a local time zone offset feature so that you can display both GPS UT time and your local time and date. For full list of features please refer to the operating manual. Printed assembly and operating manuals are not supplied with the kit; please download them from the clock kit page. A drilled, cut, silk-screen printed enclosure is available (click checkbox above when ordering), with an accessories kit containing connectors, buttons/switches, and mounting hardware. See the clock case page for details.